Programming is a subject most often lumped in with engineering or science, and there are countless books dedicated to writing better code, but is this a good approach? To me, it seems much more reasonable to understand it as a form of art. Does it matter? Yes, I think it does. I believe that this distinction is important, and I believe that many other programmers agree with it. I also think that it affects how we view and hire programmers, and, ultimately, it greatly influences the productivity of software development in many companies. I originally wrote this article in December 15, 2008, and posted it on the Aegisub blog. I’m re-posting it here for archival purposes. C would be Judaism – it’s old and restrictive, but most of the world is familiar with its laws and respects them. The catch is, you can’t convert into it – you’re either into it from the start, or you will think that it’s insanity. Also, when things go wrong, many people are willing to blame the problems of the world on it. Last weekend, the Global Game Jam 2011 was held all over the world, attracting some 6500 people into a challenge to develop a game with the theme of “extinction” in a mere 48 hours. I was joined by six incredibly talented people (and a few other friends who were supporting us) to make Planetary Plan C, our entry for the event. I was the only programmer, there was one musician, and, for the other five, each took on a mix of the roles of illustration, animation, design, concept art, and story. 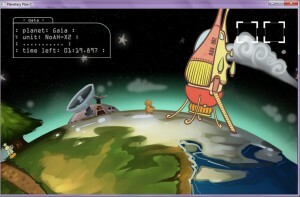 For our efforts, we were rewarded with the title of being one of the 10 winners of the GGJ11 according to Gamesauce. It was an incredibly rewarding event, and I highly recommend every aspiring game developer to join such competitions at least once. The game was written using C++ on an engine that was custom-written by myself, based on SDL and OpenGL. All of the art, music and code (except for the engine) was produced during those 48 hours. A huge “thank you” to everyone involved!